Professor Malcolm McDonald Professor MA (Oxon) MSc PhD D.Litt, Emeritus Professor Cranfield School of Management said of Andrew Levy and Judy Bartkowiak’s book, first published in 2011– Secrets of Success in Brand Licensing –It is “full of excellent practical advice but importantly is also a cracking good read”. The duo has secured fantastic contributions from many of the leading organizations and brands in the industry. 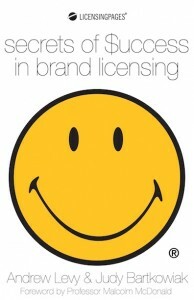 It offers an unrivalled insight into how brands including Hello Kitty, Moshi Monsters, Paris Hilton, Peppa Pig, Smiley and The Arsenal have conducted their Brand Licensing strategies so successfully securing their ownership of the $200 billion industry. For manufacturers it offers great inside knowledge as to what they should be looking for when considering taking a Brand License. There are also useful tips from Accountants and Lawyers as to the best way to conduct the contractual side of the business and from leading experts in the Retail Promotions and Market Research sectors. Secrets of Success in Brand Licensing is a light anecdotal read packed with exciting tips for professionals and novices in the brand licensing industry. The Chinese version of the book was launched at the Hong Kong Licensing Show in 2012.